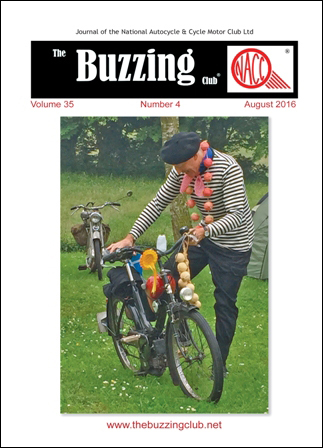 Buzzing is the bi-monthly journal of the NACC and is distributed to members of the club by post, and is currently produced in-house by the NACC. Buzzing carries all manner of information relating to cyclemotors, autocycles and mopeds, ‘for sale’ and ‘wanted’ advertisements for machines and parts, information on club meetings and runs, and more. The cost of the magazine and ‘delivery to your door’ is all included in the ludicrously inexpensive membership fee and it really is a ‘cracking good read’ packed with interesting and relevant articles. Don’t take my word for it, join the club … and enjoy the buzz! Lot’s of articles from Buzzing are filed away in the NACC Archive for reference. Below is a snippet from The Daily Telegraph newspaper which we featured in our magazine – it gives you some sort of idea of what fun you have been missing!